The Vase once was nothing more than a playful idea. 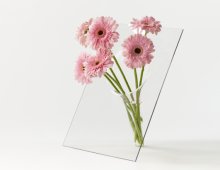 Only when the material copolyester (PET) became available on the market, the Vase could be produced according to the original idea: flawless, without any seams, and from one piece. 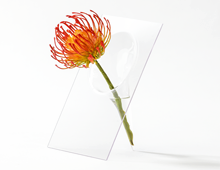 Because we aimed for maximal transparancy, we felt acknowledged when a fan came up with the name of ‘vanishing vase’. 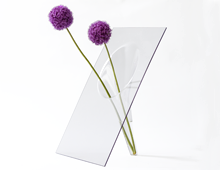 Because of its’ unique slight angle, the vase offers a new perspective on your single flower, regular bouquet or special arrangement. Every vase is handcrafted and giftwrapped in a specially designed packaging.